When you travel, it's all about gear that's portable, dependable and adds production value to your shots. When you're ready to add a jib, dolly, camera mount, or remote head to your travel kit, keep in mind the five W's. Who? What? When? Why? Where? The answers to these questions will help you select the right gear to give you great camera moves on location. "Who?" Who will make the decision to use camera movement? You never know when the boss - even if it's you - will want that special camera move. Henry Olko, director of photography for CBS News' 48 Hours says, "Gear does me no good sitting in my office when l travel. For this reason, size and weight are paramount. We use Microdolly's Jib because it is designed for the crew that has to travel light and set up quick." "What?" What shots do you need to get on location? Plan your shots and plan how you're going to get them. Niko Diehm, of Niko Productions, NYC wanted a jib shot on the desert dunes of Namibia but carrying in heavy counter weights for a jib was simply not possible. 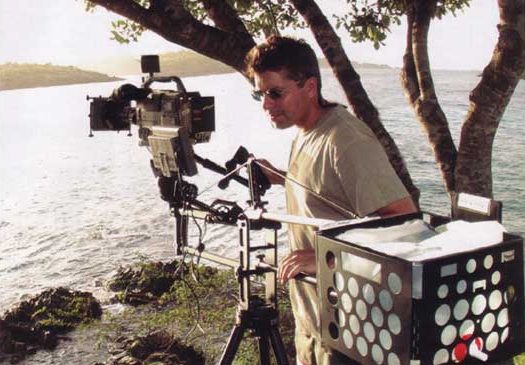 His answer was to use the Microdolly Jib with a folding weight cage and fill it with sand. Diehm added "Setup was quick and easy and the best part was having all the counterweight I needed underfoot! The footage added the special movement that put it in a higher production category." "When?" When is your shoot? Weather can be an important consideration when selecting your camera support equipment. Director of photography Rich Lerner spent eight weeks in the Arctic filming the lnvit Tribe. "Temperatures were well below freezing much of the time," Lerner said, "But, the Microdolly Jib worked perfectly and gave us some spectacular shots." "Why?" Scenery alone is not enough these days. You need camera movement to make even your best shots better. Jibs, dollies and mounts can help give your shots style and add visual impact. On a recent shoot in the Bahamas. Air Sea Land Productions director of photography Anthony Lenzo, used his Microdolly Mount to rig an underwater camera to a high speed water scooter. "We had a schedule that called for shooting in the ocean, in waterways, and in fresh water pools." Said Lenzo, "The shoot was for the Splash TV series for Nickelodeon." "Where?" Where will you be taking your camera support equipment? Your gear should be designed to go anywhere and do the job. Director Jim Watt has taken his gear all over the world for his high definition Discoveries travel series. "Were shooting in Chile, Argentina, Vietnam, and New Zealand over the next months. Many times with this kind of shooting our subjects are inanimate objects. For this reason, we take our Microdolly camera dolly and jib package. The light weight and portability make them perfect for what we're doing." Keep in mind those five W's because your next shoot may be across the country or around the globe. 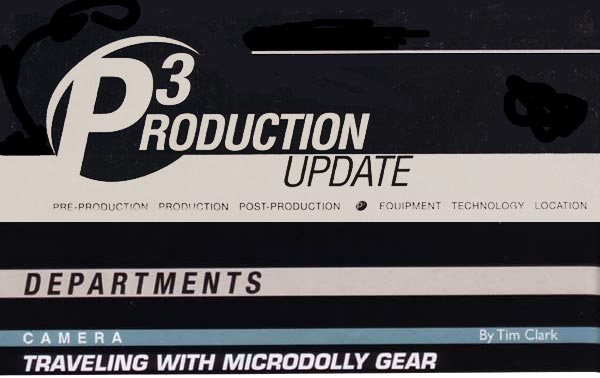 Whether its professional camera support equipment made by Microdolly Hollywood or someone else, it must be light weight, very portable, precision built and dependable. Today, clients and audiences demand more bang for their buck. And when it comes to camera support equipment, look for jibs, dollies and mounts that can travel with you and add production value to your projects.